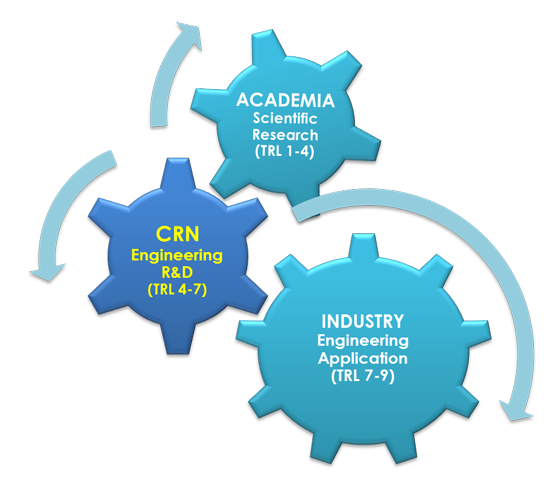 The core concept of the Composites Research Network (CRN) is to bridge the divide between academic activity and industrial need. The CRN will focus on creating Knowledge in Practice Documents (KPDs). The KPDs can be used to train new personnel at all levels, to guide the development of new products, and act as the starting point for internal company procedures after appropriate customization. In turn, users of the KPDs identify weaknesses and future needs and this leads to subsequent rounds of research, development, and improvement of the documents. In this manner, over time, the Network will become more efficient and effective at transitioning useful and relevant knowledge into industry, formulating and performing relevant research, and identifying opportunities for independently-generated blue-sky research. CRN output in the form of KPDs is available to companies that become associated with the Network. In addition, these companies can guide the priorities of the CRN and benefit from ongoing interaction with CRN personnel. By developing and using this virtual library of knowledge-based documents, the CRN is providing long-term support for industry enrichment, job growth and increased economic output. The technology readiness levels (TRL) model was originally developed by NASA to track technologies in use for space vehicles. It defines 9 levels (TRL1 through TRL 9) that move from basic research, up to system test, launch, and operations. In a more general technological sense, the range between TRL4 (research establishing feasibility) and TRL 7 (system/subsystem development) has been termed the “valley of death”, where many innovative ideas wither in a pre-commercial funding-starved and technically challenging transition. The main issue appears to be that academic interest frequently hands off its work at a stage too early to be fully tested for commercial viability, whilst industrial and applied technology activity tends to only recognize, and be prominently focused on, specific near-term goals and outputs. There is often an assumption that investment in basic science will result in technological benefits to the community. But this overlooks the difference in purpose between science and industry. It also undervalues the crucial need for an enduring interpreter between academia and industry.